Copaiba oil (Copaifera paupera, Copaifera officinalis) is a resin extracted from a tree of 20-30 m in height located in the Peruvian Amazon in the departments of Ucayali (Tahuania- Atalaya), Madre de Dios, Loreto and abundantly, in the lower Huallaga. In the Brazilian Amazon it’s in the vicinity of the Acre River. The names for this plant is: Copaiba; Bonshish matisiati and Namboman tsacati (Shipibo-conibo); Bunxix (conibo); Capaúba, Copal, Cup- grapes; Cupiúba; Jatobamirim; Marimari; Oleo-branco.y Matisihuati and in its trunk oil (balm) is obtained. The quality of our products reflect the complete organic process ofcopaiba oil ; beginning with our growers in the amazon zone(Pucallpa in Peru). Some of the various medicinal properties of Copaiba oil have been studied for their activities: antiseptic, antioxidant, healing and anti-inflammatory analgesic. 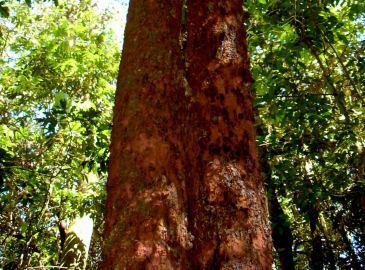 Has traditionally been used as a natural treatment for some diseases, being first mentioned in 1534 in a letter to Pope Leo X, it was attributed wound healing effect, the use of copaiba oil is both ancient and much disseminated. Copaiba is the name commonly refers to the whole copaifera gender has an indigenous origin: "Cupayba" meaning "tree of deposit" the virtue of the oil it contains and the natives attributed its medicinal properties, the term Copaiba was first used by the German botanist Georg Marcgrave in 1628, and whose insights and notes served as a base because in 1760 the botanist and biologist the Austrian Nikolaus Joseph von Jacquin w performed mada a detailed study of the species for Marcgrav. It stimulates and protects the digestive system, helping to make the digestive system more effective better and regulate the metabolism to the benefit of proper digestion. Therefore, it is used and consumed as a natural laxative, it is recommended to dilute ten drops of Copaiba oil in half a glass of water, it can be drunk three times a day, in this way, we avoid resorting to laxatives trade that ultimately only damage your health. As an anti-septic inhaled through the airway its an excellent expectorant, and can aid in the treatment of bronchitis, pneumonia, asthma, cough, sinusitis, rhinitis, tonsillitis, colds and sore throat, because unplugging the pulmonary alveoli and blood vessels. It promotes anti-septic cleaning of the ureter, and prevents cystitis (chronic bladder inflammation), or acute urinary incontinence, it helps prevent infections and stones in general and also prevents mucus in the bladder. Structural System; Strengthens bones preventing osteoporosis. Because of his great powers to counteract inflammation, and chronic pain, making it ideal to keep the joints in excellent condition. Helps eliminate muscle pains, in the spine, joints, osteoarthritis and arthritis. Do not ingest higher than recommended doses. not apply to eyes and mucous or on very large areas of skin. Laxative: This herb is used as a purgative and as a mild laxative; you should take 5-10 drops of essential oil diluted in half a glass of water at least three times a day. Healing: It is well-known in many places that copaiba balsam resin can be used on wounds and in specific treatments, for gonorrhea, pulmonary catarrh, bronchitis, fever, constipation, hidropepsia, hemorrhoids and skin disease in general. In Sitz baths 20 to 30 drops are used once or twice a day and it’s highly recommendable for reducing inflammation and pain relief and itching caused by hemorrhoids, cystitis, and vaginal infections. Skin Protector: For external use you should directly apply copaiba oil with friction and massage, and it is very effective and advisable in case of herpes, fungal dermatitis and where its properties stand out par excellence as a true and powerful antifungal. Orally: For gastric ulcers: Drink 3-5 drops of copaiba oil dissolved in ¼ cup of water three times a day before meals. For best results we recommend dissolving copaiba oil in warm water, potato or cassava (yucca or potato water): boil the water and oil , (cassava, yucca or potato). In skin conditions: Apply directly carefully massaging the affected 2 times a day, morning and before bed area.